Three blocks in the South of Market, San Francisco reveals its secrets to walkers equipped with HP IPAQ’s and GPS devices as they roam the neighborhood, hearing histories, stories and sounds of the places as it is…and as it was. Project Artaud, a 30-year old non-profit live-work studio space for artists was, in the mid-1920’s, the tooling factory for the American Can Company, can factory. 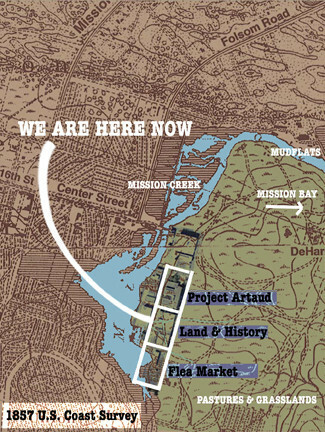 Land and History restored the sounds of the environment that existed prior to the overlay of the city — rich wetlands, marshes and shorelines, reminded of the rich cultural presence of the Native American Ohlone-Constanoan people, and brought to the surface the underground water that still flows beneath the streets today. The Mission Flea Market’s Saturday-only lively crowds and music were heard in the empty weekday lot. 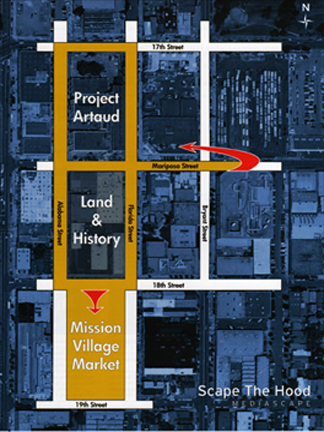 Since then, The Mission Flea Market segment has became an historic document as plans for building on the site has led to the discontinuation of this popular local weekend gathering. 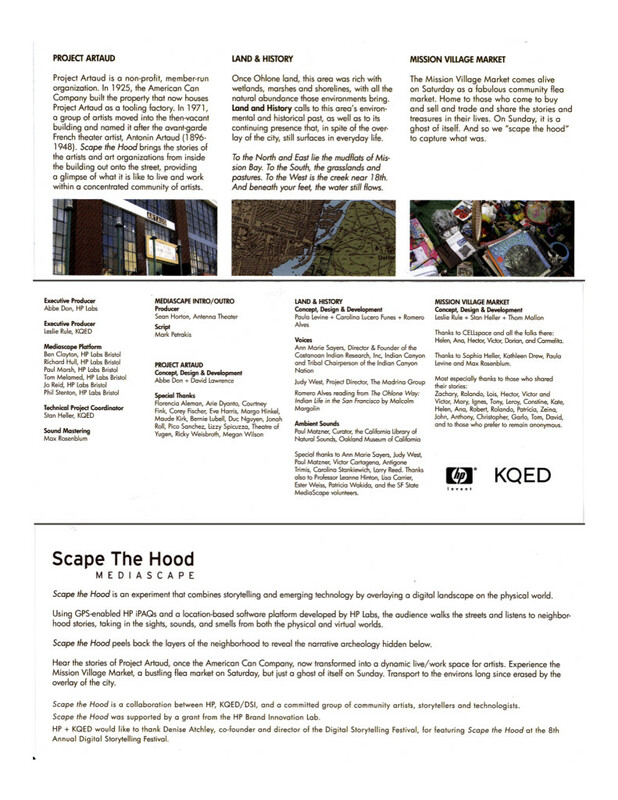 Scape the Hood : A design case study of a location based digital story mediascape This paper describes the design process and evaluation of a located mediascape called “Scape the Hood”. It is a written as a design case study and describes in detail the process by which artists gathered content, created regions and rapidly iterated through several designs using a location based software platform. 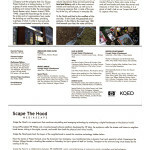 The paper highlights the nuances of designing for GPS and the lessons learned. It includes an evaluation of the experience with feedback gathered from questionnaire and interviews. 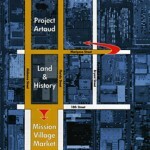 Mission Flea Market: Concept/Design – Leslie Rule, Stan Heller. HP Labs Bristol: Tom Rule, Ben Clayton, Richard Hull, Paul Marsh, Tom Melamed, Jo Reid and Phil Stenton. Sound Mastering: Max Rosenblum. Intro/Outro Segments: Sean Horton, Antenna Theater, Mark Petrakis. Additional thanks for Land & History: Leslie Rule (KQED Digital Storytelling Initiative), Anne Marie Sayers (Director & Founder of the Costanoan Indian Research, Inc. Indian Canyon and Tribal Chairperson of the Indian Canyon Nation), Judy West (Project Director, The Madrina Group SF), Paul Matzner (Curator, The California Library of Natural Sounds, Oakland Museum of California), Victor Cartagena, Antigone Trimis, Carolina Stankiewich, Larry Reed.